Populus Romanus. A.D. 330. Æ half-centionalis. Constantinople. VF. Populus Romanus. A.D. 330. � half-centionalis (1.08 g). Constantinople. POP ROMANVS, laureate and draped bust of Populus Romanus left, holding cornucopiae / Large star within wreath; CONSQ. RIC 22. VF. Constantine I. A.D. 307-337. Æ follis. Lugdunum, A.D. 309-310. EF. Crispus, Caesar. 316-326 AD. Silvered AE3. Thessalonica. Constantine I. A.D. 307-337. 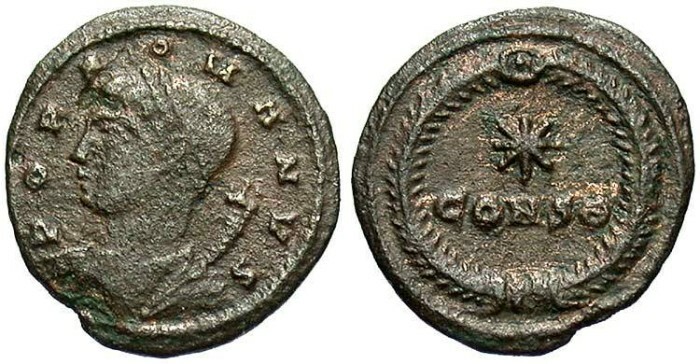 Æ reduced follis. Arelate, ca. A.D. 324-330. Near VF. Maximinus II. A.D. 309-313. Æ reduced follis. Alexandria, ca. A.D. 312-313. Good VF, silvered.